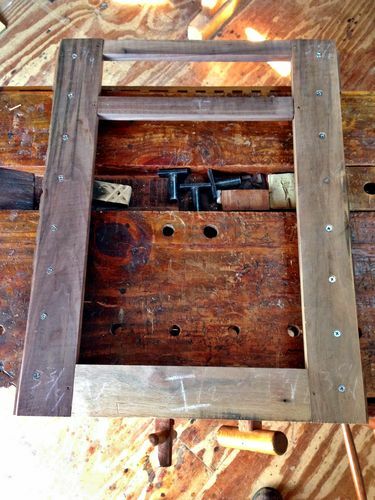 … these pieces are proud of the frame by 3/8” as they overlap the side pieces. 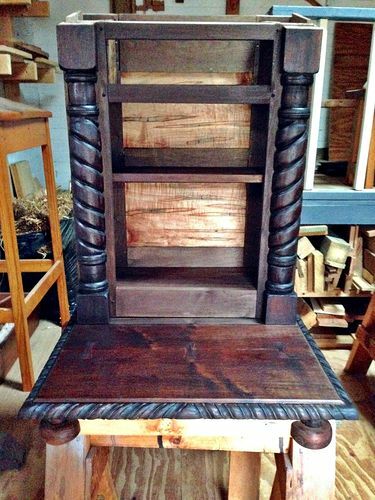 I applied the General Finishes Medium Brown Dye/Stain concoction to all the upper case pieces and once dry … glued it up! The false bottom I mentioned in an earlier post consists of two pieces. 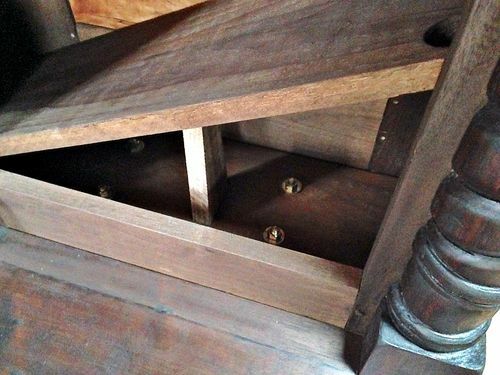 There is an unseen bottom in the upper case held in place via blind dados which gets attached to the kneeling platform via carriage bolts. Sitting on blocks above this piece is the false bottom which rides loose in the case, and is lifted out of the way via a 1” finger hole in the right front corner. And there you have it, all one unit! All that’s missing is the door, drawer and gadrooned top. The gadrooning at the top will match that at the kneeling platform. 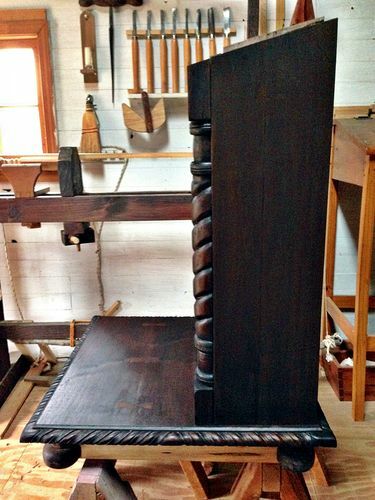 The drawer will have a simple flat front, but the door will consist of eight panels forming a Maltese cross of sorts. At least that’s my plan … we’ll just have to see what the walnut and Ambrosia maple have in mind! Nice progress, Ron. 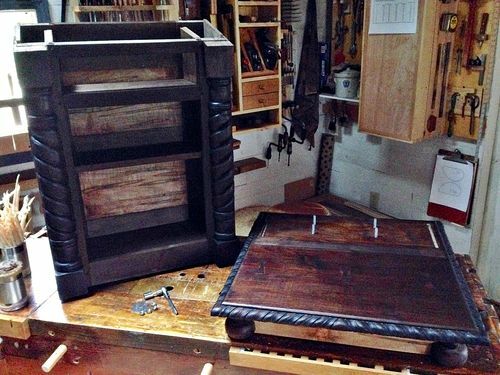 It’s looking more like furniture and less like lumber with every post! For some reason I thought the bottom section was a little taller, but it looks fairly short in these pictures. Or is that just my brain playing tricks on me? Nice progress, Ron. 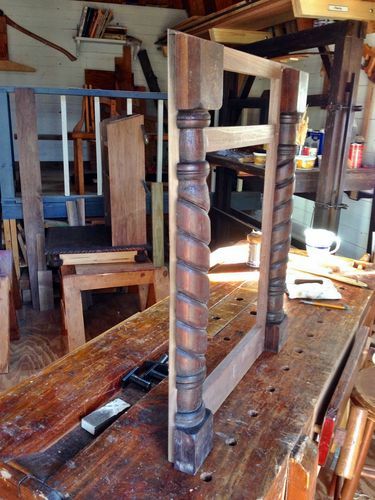 It s looking more like furniture and less like lumber with every post! For some reason I thought the bottom section was a little taller, but it looks fairly short in these pictures. Or is that just my brain playing tricks on me? Thanks, Dave. 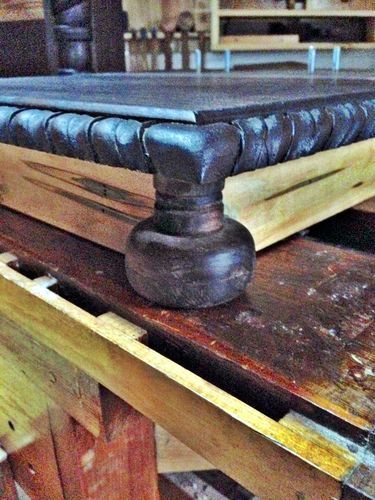 The kneeling platform is 4 inches tall … there is a 2-1/4” overhang … perhaps that’s what causes it to look shorter. Ahh. It’s the overhang combined with the lighter wood under the darker, I think. This project is coming along very nicely, great work. 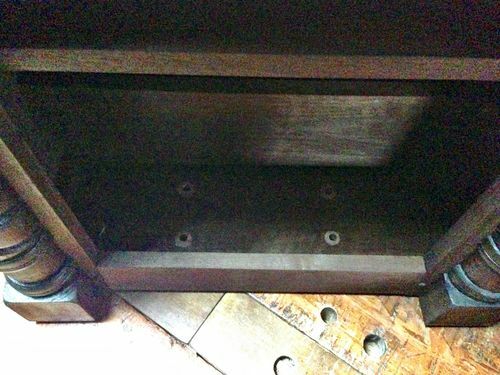 Regarding the false bottom, is the purpose of this simply to cover the bolts?, or provide some secluded storage? Hmmm … at first it was simply to cover up the bolts, but now you have me thinking of fabricating a plate to cover the bolts and have yet another secret compartment. Thanks, Tom!